It puts all your documents, folders, and applications just a single click away. 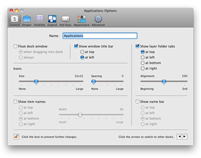 Highly flexible, it allows multiple docks, each customised to suit your exact needs. 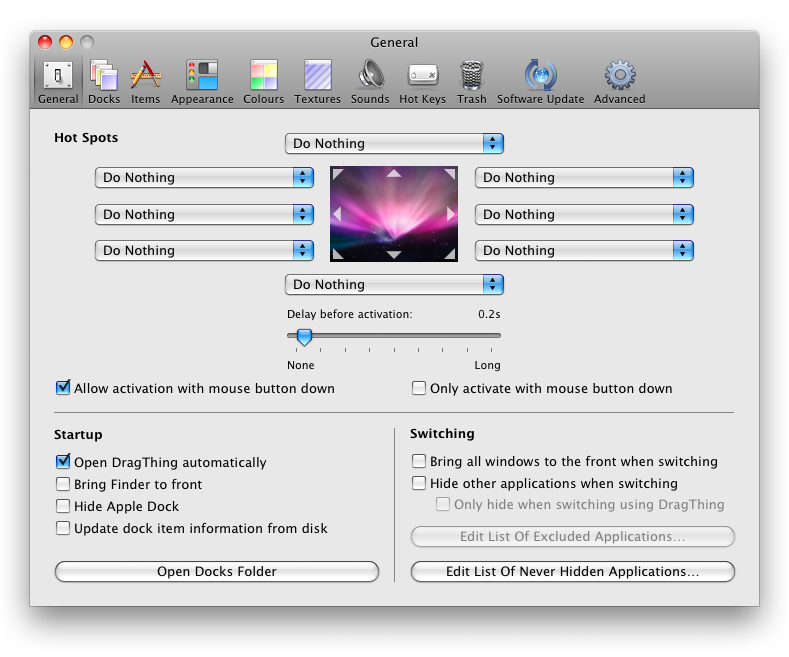 DragThing requires Mac OS 10.7.4 or later. A single user license for DragThing costs $29. Five and ten-packs of licenses cost $99 and $149 respectively. Unlimited user site and world licenses are also available at $1000 and $2000 respectively. Contact us for educational pricing on multiple licences. For details on how to pay via FastSpring, see the Buy Now page. 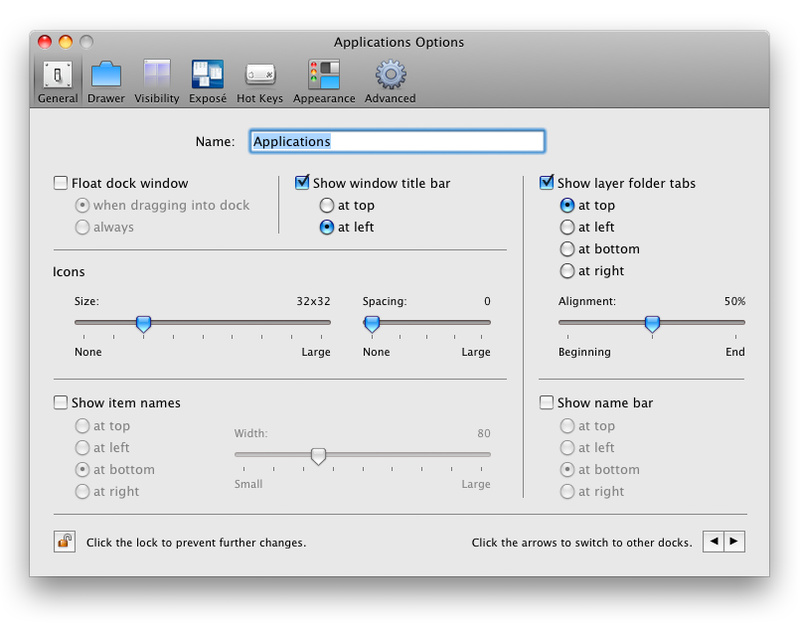 "...one of my favourite Mac utilities of all time..."
you'll thank Leopard for helping you let go of the Dock for good..."
"...that's not a preference dialog, that's The Brothers Karamazov!" 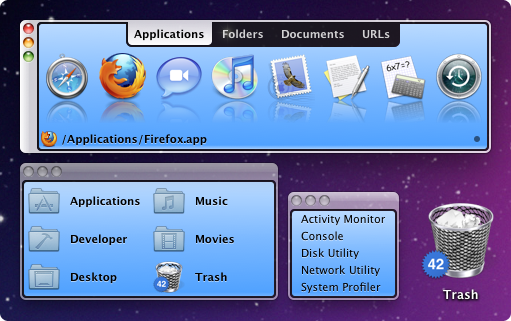 "...my editorial project multitasking moves five times faster thanks to DragThing..."
"...don't know how I ever lived without it..."
"... if I could have taken all the lessons learned in Systems 1 through 9 and applied them to System X, I certainly wouldnít have ended up with the Dock. No, I would have ended up with DragThing ..."
"...if the Dock still causes severe abdominal cramps, you can use James Thomson's DragThing..."
"...you made the switch to OS X a lot easier for me..."
"...this is a perfect piece of Mac software - clean, simple, powerful, and plugs a major hole in the user interface..."
"...a gorgeous, feature-laden productivity enhancer..."
"...a solid, easy, elegant application..."
"...one of the best launchers available..."
"...no system installation is complete until you've added DragThing..."
"...it's simple, convenient, elegant, and pretty, yet offers enough options for even the most powerful of power users..."
Finalist in the MacGeneration Awards 2004. Almost Nominated for "Outstanding Programming for a Freeware Product"
in the Second Annual Usenet Macintosh Programming Awards 1996!